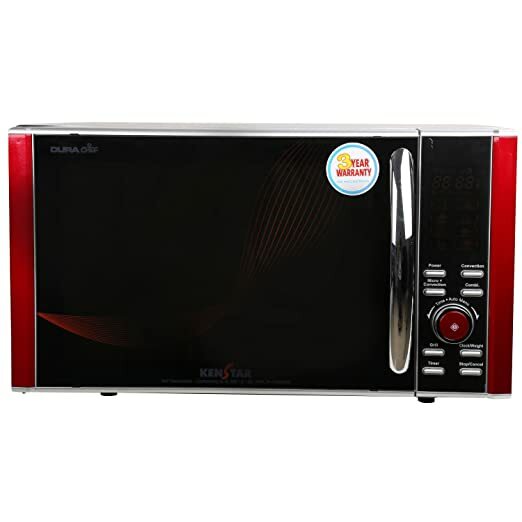 Kenstar KJ25CSG150 Convection Microwave Oven, helps you prepare healthy in less time period. It comes with 25 litres capacity and Auto Cook Menu feature with 150 auto cook menu, so that you can prepare your favourite dishes with just one touch of a button. Besides, it comes with Stainless Steel Cavity, which facilitates better reflection and uniformity in heating inside the cavity, so that you can prepare better and evenly cooked food. Also, it helps in easy cleaning of the appliance. To Recieve updates and possible rewards for Kenstar KJ25CSG150 please sign in. To Recieve updates and possible rewards for Microwave please sign in.